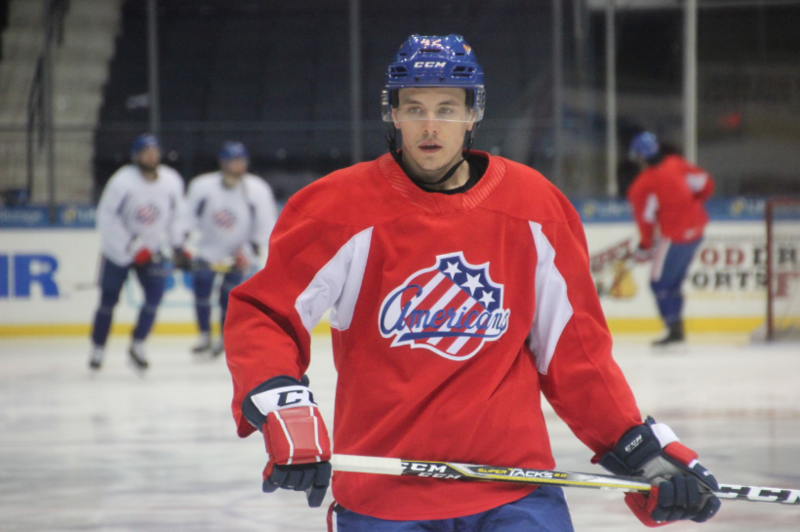 Gosselin to Make AHL Debut; Peterson Likely to Play · Let's Go Amerks! The Rochester Americans will have a player making his American League debut tonight when Kurt Gosselin suits up and plays defense against the Lehigh Valley Phantoms. Gosselin was signed on March 13th to an ATO (Amateur Tryout Contract) to finish the remainder of the season and also sign an AHL contract for the 2019/2020 season. He just finished his senior season at University of Alabama-Huntsville where he was studying marketing and communications, played well, and was given an opportunity to sign a pro contract and take a step in his hockey career. Gosselin fits the mold of the type of player the organization is looking for coming out of college and was also the team captain. The 24 year old had 15 points (4G+11A) in 25 games in his senior year at college. Through just five games with the Cyclones he already has 7 points (5G+2A). That’s a pretty good transition already scoring more goals in fewer games as a pro. One reason that Gosselin was called up is that the Amerks are currently without three key defensemen – Zach Redmond, Lawrence Pilut, and Will Borgen. Redmond is out with a lower body injury (day to day). Pilut and Borgen are called up to the Sabres. Without puck moving defensemen Redmond and Pilut there’s an opportunity for Gosselin to play a key role. A surprising thing is that there aren’t any direct connections between Gosselin and the current roster. That’s not a bad thing, just surprising. There’s almost always a direct connection where someone has played with someone else somewhere along the way. He said he’s probably played against others but it’s a new team and new friendships. “Have fun, enjoy it, put a smile on your face, and stick to the details,” is what Gosselin said the coaches told him leading up his first game here. Judd Peterson is also expected be in the lineup again for the Amerks tonight playing on the wing. He caught wind of the possible moved Sunday that it would be possible. Laying in bed Monday morning after a stretch for four games in five days his phone rang and Matt Thomas, Cyclones coach, called him and said to pack his bags. “Hopefully I can just do what I’m asked, play hard, and help the team win,” Peterson said. A year and a few days ago Peterson left college to begin his professional career and he’s been a key piece of the first place Cyclones roster. Like Gosselin, he’s a depth player that will continue to play to prove his value at the next highest level. He laughed when I said and you’re getting paid versus studying. Will Borgen is a friend and former teammate also left college at the same time to begin his pro career, they played three seasons together at St Cloud State. Peterson said he gave him a big hug because they haven’t seen each other in a few months and was excited for a friend to get his first NHL call up and mentioned how special it is for Borgen to get his NHL debut. With only six defenseman in the locker room there’ll be a lot of minutes available for everyone on the blue line to step up and play. Look for Nathan Paetsch to get some lead power play time as well. I also wouldn’t be surprised if they went with five forwards on the power play depending on how things are going. The Amerks can officially clinch a playoff spot tonight with a regulation win and a Belleville loss in Syracuse tonight. Amerks assistant coach Gord Dineen said, “We would have liked to have done it a couple weeks ago.” The goal is still chasing first place and clinching on their own terms with a win. Puck drops at 7:05pm against Lehigh Valley, first of only four regular season home games remaining before the playoffs.